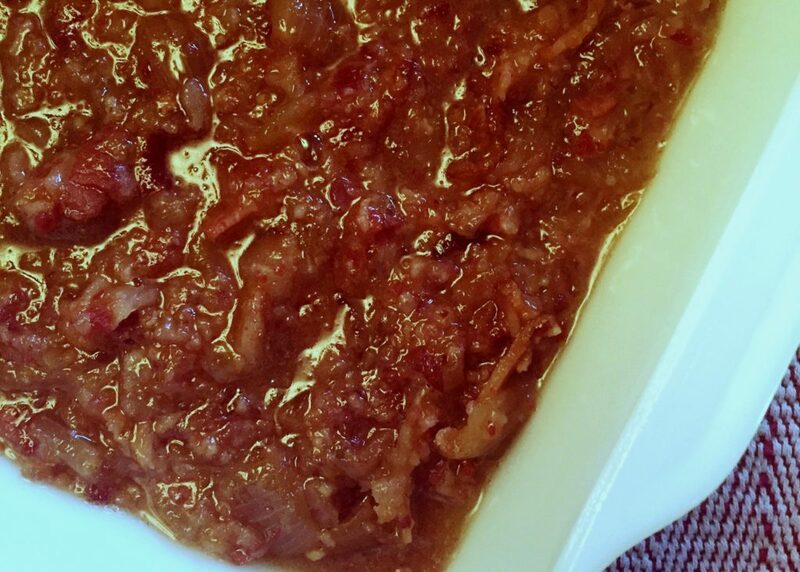 We love a good bacon jam — it’s so easy to make in the slow cooker. Make a batch over the holidays and serve it with baguette slices as an easy party food and then spread the leftovers on a flatbread crust for a pre-Christmas pizza night. This sweet and savoury spread is perfect as a party appetizer or spread on a pizza crust. In a large saucepan, cook bacon over medium-high heat until the fat is released and bacon is lightly browned but not crispy. Using a slotted spoon, transfer bacon to a plate lined with paper towels and let cool. Drain off all but 1 tbsp (15 mL) fat (keep it to fry potatoes later — that grease is gold!) and add onions to the pan. Sauté until onions start to soften and become translucent. Add garlic and sauté for 1 minute. Stir in brown sugar, vinegar, coffee and bourbon (if using); bring to a simmer. Scrape into a 4- to 6-quart slow cooker. Stir in cooled bacon and spread the mixture evenly along the bottom. Cook, uncovered, stirring occasionally, on high for 3 to 5 hours or until the mixture thickens and becomes syrupy. Use an immersion blender to purée the jam (or let cool and transfer to a food processor to purée) until it’s spreadable but still slightly chunky. Store in an airtight container in the fridge for up to a month. Posted in Book Recipe A-O, Appetizers, Dips & Sauces, Beef, Pork & Lamb, Slow Cooker.